Chronic kidney disease is still a big problem in Indonesia, it is estimated that the number of chronic kidney disease patients increased from 19,612 to 100,000 between 2012 and 2019. Chronic kidney disease means the kidneys can not work well to maintain the balance of chemical substances in the body so that patients require action Dialysis. In 2017, RS. Kasih Ibu Surakarta became the first pioneer of a private hospital in Surakarta that provides CAPD services. The Peritoneal Dialysis / CAPD (Continuous Ambulatory Peritoneal Dialysis) service is a dialysis process in the abdominal cavity, where the peritoneum as a semi permeable membrane serves as a place through which the body fluids and toxic waste of the body’s metabolism are removed. The dialysis is one of the renal replacement therapy to restore the body fluids and electrolytes as normal as possible. Dialysis therapy consists of hemodialysis (HD) and Peritoneal Dialysis. Since April 2006, RS. 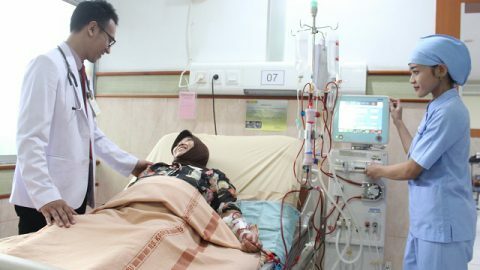 Kasih Ibu Surakarta has opened a hemodialysis unit. Up to now, hemodialysis services have grown with the addition of HD machines to 21 and the addition of qualified and certified medical personnel. Dialysis Unit RS. Mother’s love serves routine HD, 24-hour Emergency Dyalisis and Dyalisis specifically for patients with Positive HBsAg.